Byavatnet is a lake in the municipality of Levanger in Trøndelag county, Norway. It is located about 2.5 kilometres (1.6 mi) south of the village of Ekne and about 3 kilometres (1.9 mi) west of the village of Ronglan. 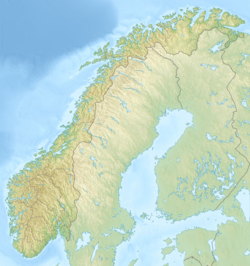 The lake Hammervatnet lies about 3.5 kilometres (2.2 mi) south of Byavatnet and the lake Sønningen lies about 1.5 kilometres (0.93 mi) to the northwest. The 2.31-square-kilometre (570-acre) lake is about 5 kilometres (3.1 mi) long and about 800 metres (0.5 mi) wide. ^ "Byavatnet, Levanger (Trøndelag)" (in Norwegian). yr.no. Retrieved 2011-05-24. This page was last edited on 2 April 2018, at 16:04 (UTC).